I was a latecomer to the DWM comic collections for really very lame reasons, but a little under a year ago I chewed my way through all four Eighth Doctor ones in less than a month. They're bloody brilliant, and a large part of why they're brilliant is the companions. 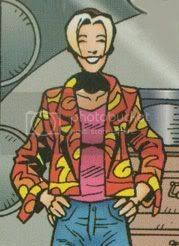 Unlike Sam in the books and Charley in the audios, Eight's main companion in the comic, Izzy Sinclair (or "Izzy Someone", as she calls herself before she resolves her issues about being adopted), is neither blonde (well, not completely; she has highlights) nor in love with the Doctor. She has got the inevitable late '90s SF character thing of being an SF fan so they can make self-referential jokes, but I've never really minded that. Izzy's a resident of Stockbridge, a town you've never heard of if you haven't read the comics but if you have it's where the Doctor goes all the frakking time. Anyway, Izzy is friends with a local UFO spotter named Max who Five got caught up with this one time, and after they get involved in some business with the Celestial Toymaker (who I find yawnsome, I'm afraid, but at least he gives them an excuse for the Scrabble tiles spelling out the name on the cover and stuff, which is wicked cool) and ends up coming on board the TARDIS afterwards. This is the first story in the collection Endgame. 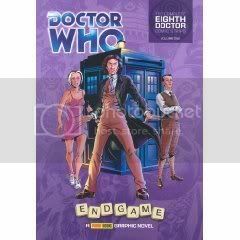 A couple of adventures later (still in Endgame, collections-wise), in an adventure called, erm, "Tooth and Claw", they run into Fey Truscott-Sade, a British secret agent from the 1930s, who the Doctor has met in a previous unseen adventure and who is asking for help now. There are hints of mutual attraction between Izzy and Fey almost from the very beginning; there's one lovely panel where you can actually see Izzy go a little bit weak at the knees (I will do my perennial "waah, if only I had a scanner I would be able to show you this" thing here and then shut up, but suffice to say that any time I am describing things in detail it is because of the picture/words exchange rate being so high). Things get very complicated very quickly, however. The Doctor is in a bad state at the end of T&C, and has to be taken home to Gallifrey. Fey manages to do this by reading the manual (leading to a cooling between her and Izzy as Izzy feels somewhat unneeded in comparison), but things on Gallifrey are themselves in a parlous state and it's only with the help of matrix-construct Shayde that the Doctor gets through it all. He appears to regenerate (into Nick Briggs! ), but this is actually a fakeout: Shayde has taken the Doctor's place so that the Doctor can get one over on the Threshold, the people responsible for Ace's death on the moon in yet another of her divergent fates. 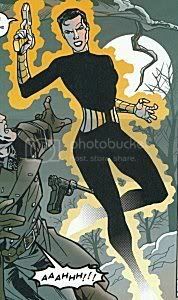 The Threshold, thinking the Doctor is weak after his regeneration, strike -- they have been using an unwitting Fey to monitor things ever since Tooth and Claw; turns out she was only able to read the TARDIS manual, written in Gallifreyan, because of their interference. The fakeout is revealed, and the Threshold turn out to be basically Shayde's cousins once-removed. In the final battle, Shayde is badly weakened; cut off from the willpower of the "Matrix lords" on Gallifrey that powers him, he is helpless. Until Fey steps into the breach and merges with him, offering her willpower instead. 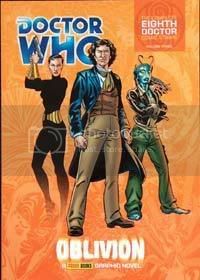 The merged Fey/Shayde depart, and the Doctor and Izzy go on to more adventures. The third collection, Oblivion, is the first in colour and the key one for all of this stuff. Izzy meets Destrii, an alien fish-person princess-on-the-run, who swaps bodies with her and attempts to get on board the TARDIS. The Doctor realises, however, and goes back for the real Izzy in Destrii's body (unfortunately, Izzy's original body with Destrii in it is seemingly destroyed). Thus begins a fairly long arc in which Izzy is trapped in this new body, gradually trying to come to terms with it. 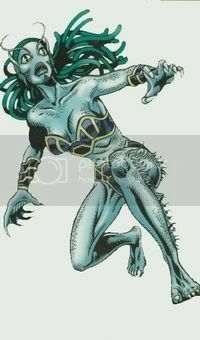 But Destrii's people are looking for her and kidnap Izzy by mistake, taking her "home" to the desolate planet of Oblivion. The whole process leaves Izzy with a new confidence. As Fey leaves, they have a chat about it that ends with Fey kissing her and it's just one of those lovely moments that makes you melt.